First Impressions: I love this card because it is so more more engaged than the typical two of wands where the man is looking passively out at the ocean. 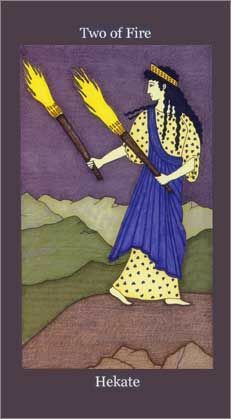 Hekate is truly engaged and actively looking at the path. I love this reading, especially about taking the next meaningful and appropriator action and then you will be provided with the next. This reminds me of the cairns and the lesson that they taught me. As I reflect, I realize that the lesson is really one of trust. Walking to the first cairn, I had to trust that the next one would be there. I suppose it is that way with the reset of my life as well, I have to trust that the next cairn will be there. That's really really hard for me as I want the whole path laid out for me at once, but that's not how the world works. I don't know what the next adventure that awaits me is, but all I need to know is what the next step is, so what is the net step? Have I missed it by being stubborn? Even though every instinct in my body says it is time to move on from my job and it is time to leap, they are telling me very clearly to stay put. I've always been the one who got dissatisfied and leaped rather than stay and work through the feelings of discomfort. They are telling me that there are lessons to be learned in trust and perseverance. They're telling me to sit with the discomfort instead of running from it. I can find all sorts of ways to justify running, but they are telling me that none of them are valid. The funny thing is that I stayed in my marriage way too long even though I knew it was time to leave but I would leave jobs at the drop of a hat. The funny thing is that I have been better about not leaving jobs since John and I split up, but the instincts are often still there just like they are now. I'm going to choose to trust them.